Unless you’re whittling a piece that you chopped from a tree, all the wood in carpentry projects came into contact with a circular saw blade at some point. But the circular saw blade is easy to neglect. We know when the blade gets dull but how are you caring for circular saw blades between the time you buy it and when you throw it in the trash? As it turns out, there are several ways to keep the blade in good condition and even extend its life. This article presents Pro tips on how to care for circular saw blades—including table saw blades. Be sure to check out our table saw safety tips and thoughts on the blade height debate. Although the blade is idle the vast majority of its useful life, it doesn’t mean it can’t get worn when not in use. Steel corrodes, so moisture and humidity will degrade it. Particularly on more expensive blades, consider removing them and keeping them dry when not in use. This goes for the workshop and especially on job sites. Any time you can remove a blade from excess humidity and store it in a dry area, you win. This increases the length of time your carbide teeth will retain their optimal edge. Many circular saw blades are billed as the one to rule them all, but different blades are truly suited to different applications. Preserve the blade’s life by using it appropriately. Don’t cut stee with a standard carbide blade. Don’t take a fine tooth blade and cut laminate when you can get a specialty blade that will do the job for less (by not trashing your $150 finish blade). Don’t let the blade’s kerf rest on the ground but hang a blade through its center hole. This can be as simple as a nail or screw in the wall, but at least the blade won’t be dulled by the floor or a shelf. This may seem minor, but after a while all those scrapes and dings take their toll. Many floors have been damaged, cords cut, and toes endangered when a circular saw’s blade guard failed to cover the spinning blade after a cut. It’s another good reason to inspect your tools. It also pays to consider a circular saw that includes an electric brake. Most electric brakes stop the blade from spinning in 2 seconds or less. Grime can accumulate on a blade. This slows down the cut noticeably and also promotes burning. Clean it every so often with a nylon brush and gentle solvent to refresh the carbide teeth and expose gullets. Try the solvent on a small area first though – some blades have a coating that can come off if you use too harsh a chemical. As we mentioned in our table saw blade height article, a lower blade can cause the blade to get hotter, especially with harder woods. 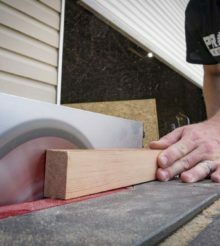 Keep it higher for hardwood, and give it a break for longer cuts or during extended use. We hope you’ve benefited from our Pro tips on caring for circular saw blades. If you’re a Pro and you have circular saw blade care tips, add them in the comments below or shout out on Facebook, Instagram, and Twitter. This article originally published on February 6, 2017. Great tips, is important to use sharp blades in order to make clean and fast cut in your material also used the right blades for the job.